Public awareness on environmental matters has never been so strong. Yet, the environment is still being decimated and abused with the blessing of government entities. MEPA, the competent authority for environment, is under the responsibility of a parliamentary secretary, and falls within the Prime Minister’s portfolio. Projecting colourful fireworks’ toxic smoke, killing of species, and ODZ ‘tweeting’ are higher on the agenda than any tangible national policies for the good of society and the environment at large. Once there was a party in government who in 1980 initiated regulations for the protection of biodiversity, and had a vision to green Malta and push afforestation. Surprisingly, that same party is in government today, albeit with different faces, different visions, and different principles. It seems that the complete exploitation of the environment, despite its social, ecological, economical, educational, scientific, psychological, and quality of life contributions, is a new principle. As are the dismantling of environmental regulations. Times change not only names, faces and logos, but also basic principles it would appear. An authority that is funded by the public turns a blind eye on social and ecological negative impacts. No finger is turned to stop the decimation and butchering of biodiversity. Spraying of chemicals to kill every living species growing for free goes uncontrolled. Millions of euros are spent to dump free natural sources in the sea. A directorate which once was responsible to see that these do not happen is in deep freeze. The mentality of pecuniary and materialistic greed at the expense of society and the environment rules the day. EU funds are still used and spent without any ecological consideration. Commercial banks still sponsor without ensuring that some of the funds do not go toward the loss or destruction of biodiversity. Politicians are not concerned about loss of biodiversity with the funds provided. The Environment Directorate is abused, gagged, and hijacked till hopefully it gives up its ghost. Mepa has become more of an environmental hazard than environmental protector. Can anyone be blamed for believing that government does not have any vision or interest in collective social and environmental gain? The government’s manifesto, if electoral manifestos are anything to go by, clearly explains that a well-protected environment leads to a better quality of life. The new government had to seriously administer and be greatly committed to the environmental sector. It had to work with determination to make up for lost time, aware that there are a number of difficult decisions to be made, amongst them the upheaval of MEPA. It had to take this measure in the interest of our national environment so that it will be in a better position to address the challenge (electoral manifesto p. 93). The separation of the environment and planning directorates within Mepa, was intended “to strengthen the environment’s autonomy” and “to give more importance to the strategic aspect and long term vision”, “to reach a better balance between conservation and the protection of the environment and responsible development.” (electoral manifesto p. 94). Yet after 21 months in government, Mepa remains responsible for environment protection, playing havoc in this sector, not wanting to have anything to do with environmental protection. Mepa’s environmental management is far from the elected commitments made by the party in government. The procrastination in bringing about the promised demerger does not help to convince anyone that government is keen on immediately honouring its electoral manifesto even on such a delicate matter which will affect the future of the islands. Such a vacuum and delay is undoubtedly being capitalised, to the detriment of society and the environment. It is very clear that the official pro-business vision is sucking Malta’s resources dry. The Minister, who on paper is responsible for the environment, will eventually be handed a dead skeleton of environmental structures, impossible to resuscitate, if at all. The ‘not-my-fault’ syndrome has unfortunately undermined any sense of good governance. Sometimes I ask myself whether the environmental remit has been politically omitted from the Environment’s Minister portfolio and divided and fragmented among other Cabinet ministries so that it would be easy to say that no one is responsible when environmental protection is everyone’s responsibility? In the run up to the election, the Prime Minister said that if any voters were not happy with the way ministers were handling their responsibilities according to the manifesto, they should refer the matter to him directly. The letter signed by present and former presidents of Din l-Art Ħelwa regarding the pitiful state the environment was a first step. It was followed by a group of other environmental NGOs. I would also like to bring to the Prime Minister’s attention, the manner the environment is being mismanaged and exploited. There is no doubt that the legacy this government will be leaving to future generations is indeed shameful and does not do any honour to any politician, if honour is valued any more these days. Ironically, the environment falls within the portfolio of the author of the electoral manifesto. He is definitely being advised by the wrong people, some say conveniently, though I do not agree with this. The latest comments by the Prime Minister can possibly shows that he is not happy with this sad state of affairs. And rightly so, because there will definitely not be much hope for the environment in the future with the big irreparable negative impacts this will have on society, which will eventually have to pay the price for such political mismanagement. Mepa playing havoc with environmental matters is definitely not in line with the electoral manifesto’s commitments. Not only will lost time not be recovered (electoral manifesto p 93) but such lost time is being extended and extended until there will be nothing left to recover. Having hijacked the planning authority, the pro-business mentality driving force is holding society and the environment to ransom. Environmentalists who have the real national interest at heart, consider 2014 as a very bad omen for the future of Maltese environment. Will this new year offer new hopes, new visions, new sustainable life for the benefit of society and the environment? The momentum of environmental degradation through the vision of exploitation at all costs raises serious doubts amongst those having the well-being of the country at heart. I only hope 2015 will prove me wrong, not through political blah-blah but by genuine social and environmental tangible measures. Political environmental awareness reached its climax in 2004 before accession to the EU. Membership achieved, environment started a political nose­dive. ‘Merged’ with the Planning Authority, it was hijacked, destabilised and emarginated. Look at how environmental matters are being handled today by MEPA, politically referred to only just for convenience sake with no conviction at all. This led nine environment NGOs to show their disapproval of the lack of professional management of the environment. 2013 can be regarded as the year when environment disorientation reached its peak, and environment conservation hit rock bottom. To the extent that MEPA ­ the competent authority for the EU Environment Acquis is not within the control and not in the portfolio of the Minister for the Environment, but managed and run by the Office of the Prime Minister, through a Parliamentary Secretary. MEPA, who never really showed any zeal or understanding of environmental responsibilities, except for producing nicely coloured publications and policies, which nobody takes any notice of, not even Mepa itself, had a field day. Stable doors were flung wide open allowing horses not only to gallop out but to stampede over all environmental and social considerations. Reason for this sad and sorry state of affairs is that the environment and planning directorates are going to be separated. All environmental matters are in deep freeze, till the day, when the surgical operation of dismembering Mepa will see the light of day. In the meantime development permits are being dished out with little, if any, environmental or social concern. When the environment is given the kiss of life, then it won’t be MEPA problem any more to see how the vacated stables door can be closed to keep the freed horse inside. Why was MEPA not included in the environment portfolio until the operation takes place, and then the planning directorate passed to the appropriate Minister? Because environment is not a priority. It never was. Rain water which comes for free is chanelled to the sea. Then sea water is pumped up to be desalinated by energy consuming desalinators! being unique in the EU! Still another Minister trying to find his way through an inherited tangled cobweb, trying to plug the holes through which water tankers plying the local streets, selling water extracted for free from the aquifers. Another Minister is financing the desalination of sea water (containing dumped purified drainage water) by energy consuming desalination plants. I cannot not mention water park, the dancing fountains and the expanses of turf being laid, taking gallons and gallons of water sprinkled everyday with the approval of the Ministry for landscaping. And a postponed and postponed national water policy, in the face of a possible EU infraction. Great Political management of the environment! Shall we soon be singing ring a ring o’roses? God forbid. the Gozo Diocese’s environmental and social conscience. Only God can forgive such an environmental and social crime, approved in 2013. 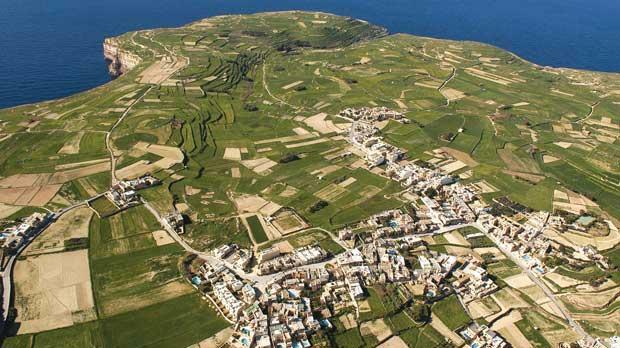 To add insult to injury, this happened in Eco ­Gozo, cementing the lip service for ecological protection and the lack of understanding of biodiversity. The good thing about environment in 2013 is that I have run out of space, and cannot delve deeper on the proposed changes to the Outside Development Zones, and Structure Plan; the Xemxija scandalous planning decision, biodiversity loss and the invasion of alien species, and other policies in the pipeline in favour of further myopic development, such as land reclamation, Hondoq ir-Rummien, the Malta-­Gozo tunnel both in Eco Gozo, all burdening the environment and society with more hidden costs and destruction. What of 2014 one might ask? Following the liaise-faire in environmental and social awareness by politicians and other social entities since accession to the EU, one can only say that environmentalists, socialists and nationalists (nothing to do with politicians) atheists and believers alike, would better fasten their seat belts. Past decisions can only reflect further destruction of the environmental and social fabric, rendering our country a difficult and unhealthy place to live in. The momentum of these negative impacts on society and the environment can already be seen and felt. Development and money matters are holding the political decision makers of this country at gun point, at a cost to the environment and society. Every time I get to think about this, with every thought of where all this will lead us to, makes me feel that I can’t tell the bottom from the top. Am I standing on my head or on my heels? Is it cloudy is it bright? Is it day or is it night? Am I wrong or am I right? And is it real? Environment destruction is turning our living upside-down. But why cannot this country ever grow up? I have as yet refrained from answering my question as to whether all this is sheer inexperience in good governance, or a shrewd diabolical political psychology. The Rural Development Programme 2014-2020 which will eventually be submitted to the European Commission for funding, was discussed at a public consultation earlier this month. The synopsis presented contains positive ideas. The full report was not available being ‘a long and detailed document’ and ‘not easy to use for public consultation’. This greatly hindered more indepth suggestions and comments. Could it not have been uploaded on the department’s website? The synopsis is based on the strengths, weaknesses, opportunities and threats of rural development based on five themes, with objectives and activities for funding. Theme 1 deals with water, wastes and energy. Can water be managed in the absence of a national water policy? The present fragmented ‘management’ reveals a ministry digging a tunnel to channel rain water directly to the sea. Another purifying sewage water and dumping it in the sea. A corporation managing and distributing potable water while a secretariat is trying to plug holes and mend cracks in water reservoirs and cisterns. Such lack of coordination and waste of financial resources, most of which are coming from the EU, does not augur well. This was also pointed out by the representative of the Malta Water Association during the public consultation, adding that lack of access to the original draft report restricts discussions. Activities suggest investment “in water management, abstraction…” Does this mean that abstraction will be funded when this is being tackled by another ministry trying to control and regulate it? Theme 2 deals with Maltese quality produce, highlighting the need for quality assurance, poor enforcement of regulations and support for adding value as the major opportunities. The GMOs Pandora’s Box that farmers and consumers are being offered and possibly swallowing and the ever-increasing public rejection of GMOs can be capitalised upon by the farming community. Not only was this not even referred to but a farmer’s representative was heard saying that farmers cannot do without GMOs! Theme 3 refers to sustainable livestock. A positive item under activities to be funded is the support “for activities that reduce livestock farms’ impact on the climate and environment”. This can perhaps address the issue of past EU funds used to build such livestock farms on sensitive water table areas, rendering the water so nutrient rich and unusable. Theme 4 deals with landscape and the environment. The objectives are great and the wording is even nicer. But this is another subject where fragmentation reigns supreme. Landscaping is under the responsibility of the Ministry for Transport where the main driving force is devoid of any ecological input. Mepa is the competent authority (on paper) under the responsibility of the Prime Minister’s Office. It is no secret that Mepa has rarely raised a finger to protect any tree and often turns a blind eye to all mutilation, uprooting, chemically-killed trees and introduction of alien species. Local councils, under the responsibility of the Ministry of Tourism, go on a rampage ‘pruning’ trees with no questions asked. The reply to my question as to who will be the regulator in such landscaping was no reply at all, sending shivers down my spine. The sanest political, technical, administrative, ecological, economical, legal way forward is that the regulator has to be the Minister for the Environment. This will ensure that there will not be any cow itch trees, fountain grass, flame trees et al. or turf growing in rural areas. And EU funds will be used in line with EU obligations, not as has happened in the past. The funding of “new skills and knowledge (that) will be required in terms of landscape management, ecological understanding, conservation and practical skills” is a good idea if well managed and executed professionally. The maintenance and restoration of rubble walls brought a rumble of disappointments by many who have been waiting for five and more years to restore the breach in their rubble walls. Breaches in rubble walls contribute to soil erosion, which fills valleys, and eventually is carried out to sea. Cannot photos and videos record such breaches to allow their immediate restoration and then farmers be reimbursed by the RDP? A one day’s wait, especially during the rainy season, is too long for this fragile environment, resulting in ecological and additional expenses. Among the objectives listed is the development of bed-and-breakfast business, which is also a good objective. However, if its implementation does not encompass the ecological impact it can be bizarre in such a small island State, the more so when experts and representatives involved in such activity omit biodiversity experts and the Ministry for the Environment, whether by conviction or for convenience. The unnumbered delivery section outlines other actions, including ‘valley management/landscape management partnerships’ and a ‘rural resource hub’. The first is urgently necessary even from an ecological point of view but, God forbid, if this is executed on the lines of past years without any holistic professional input but just by bulldozing earth to temporarily please the eye and inflict ecological damage. The ‘rural resource hub’ is also welcome and can fill the void and neglect so conspicuous during the last decade. The once beneficial government experimental farm has, during the last years, been used more by domestic cats, dogs and pets. The once experimental farm can help educate, train, give technical knowledge advice and hands-on experience to all stakeholders in rural development. These are but a few reflections and suggestions on the abridged consultation document, without having access to the original draft and keeping in mind that “precise details may well change over the next year, as discussions and agreement are still being developed in Brussels”. Unfortunately, the economic bias of such a report completely dwarfs the sensitive ecological obligations. The outline nonetheless contains important and useful points that can contribute to rural development and Maltese biodiversity with some dotting of the i’s and crossing of thet t’s. Alfred E. Baldacchino is a former assistant director at Mepa’s environment directorate. The future: our future; What future? What are we doing to our planet earth? Is this what you are contributing to? Are you planning such a future for mother earth?